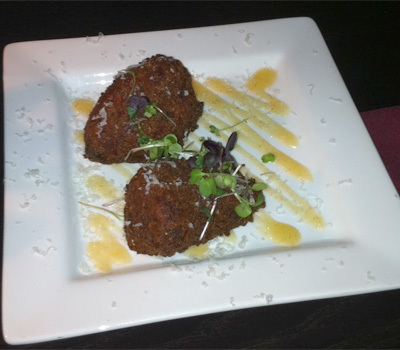 Casa Naranja offers a wide selection of tapas including many vegetarian options. As mentioned previously, I try to avoid all things vegetable whenever possible, however I was tempted and ended up succumbing to at least one option at Casa Naranja. 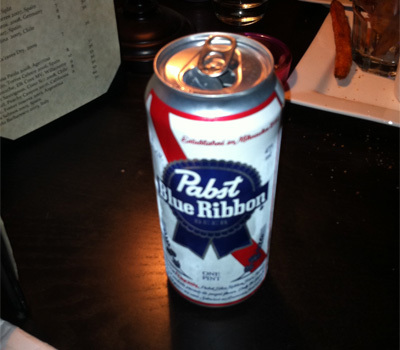 One thing I’ll give Portland is its appreciation of all things beer – including Pabst Blue Ribbon. Before you knock it for being piss-water or a-quick-way-to-fill-a-beer-bong, keep in mind that PBR is an affordable beer with a light flavor. Casa Naranja’s menu holds an expanse of spices and flavorings, and the last think I wanted to do was kill a tapa by pairing it with the wrong beer. PBR is never the wrong beer (though some might argue that it is always the wrong beer – these people would be wrong). 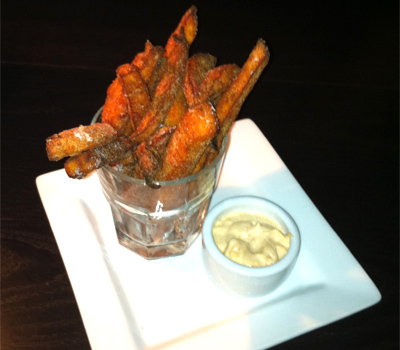 For starters, we grabbed the Yam Fries with Lemon Cayenne Aioli. They arrived the table fresh from the oven at the burn-the-roof-off-of-the-top-of-your-mouth heat level. Once we let them cool a bit (and let our mouths heal a bit), we partook. Yams are very close to sweet potatoes. Apparently, there are some subtle differences, but I’ll let you check out Wikipedia’s explanation for more on that. I don’t like sweet potatoes. At all. I don’t like the fries. I don’t like them as mush. I don’t like them. However, I allowed myself to try out these yam fries, and they were great. Why? Casa Naranja prepared them in such a way that the yam flavor didn’t overwhelm the fact that I was eating a fry. Next up were the Chicken and Fennel Stuffed Piquillo Peppers with a Honey Cayenne Aioli (you may notice that Casa Naranja tends to be a big fan of aiolis). Like sweet potato fries, stuffed peppers can have the tendency to overwhelm the tastebuds, too. The Piquillo Peppers did not. In fact, they were almost underwhelming. The texture of the entire pepper was soft, and the fennel added a nice bit of spice to the chicken. I greatly enjoyed the honey cayenne aioli, which both sweetened and spiced the tapa. The burger obsession here at Stumped in Stumptown might be getting a little carried away, but here we go again. The Painted Hills Casa Burger is a 1/2-lb. juicy burger with goat cheese and other spices. 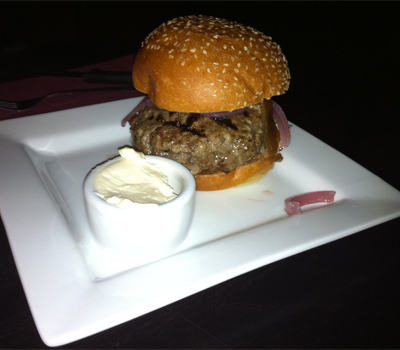 Be forewarned, goat cheese brings with it great power, and if you’re not a fan, this burger is absolutely not for you. 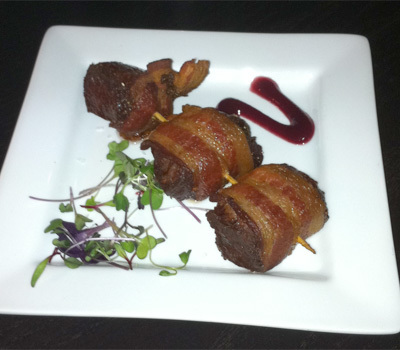 Finally, the best for last (at least, in my opinion) – the Bacon-Wrapped Painted Hills Flat Iron Steak Bites with a Cranberry Coulis. Wrap anything in bacon and you’ve piqued my interest – take Voodoo Donut’s bacon-wrapped maple bar as an example of that. But wrap meat in bacon, and you’ve got me. The steak bites are exactly what you want – juicy bites of steak wrapped in bacon. 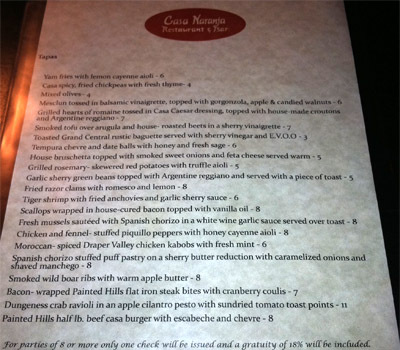 But, Casa Naranja wasn’t content to just serve steak bites – they added a sweet, tart and tangy cranberry coulis. The combination of meat and sweet is such that this tapa quickly became my favorite of the evening. If you find yourself hungry in Mississippi for a more intimate eating experience with a Mediterranean flair, Casa Naranja rises to the occasion with a fully-optioned menu and a selection of tapas that will blow your mind.